I am interested in having a hair transplant this year, but I have read that you have to take Rogaine after surgery. Is this true? I always thought Rogaine caused hair shedding. Surgical hair restoration is a stand-alone procedure that does not require any pills, lotions or potions to grow. However, many feel that Rogaine (minoxidil) could help speed up the growth of their procedure. There are three phases in a hair follicles life cycle, the anagen (growth) phase, catagen (transitional) phase and telogen (resting) phase. While the exact mechanism of how minoxidil works is relatively unknown, many believe that it works by accelerating and prolonging the anagen (growth) phase. 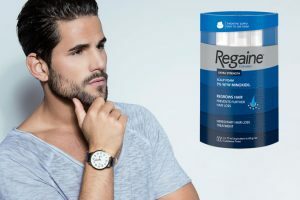 Rogaine (minoxidil) was first manufactured as a drug to treat blood pressure in the 1980’s however, it was later discovered that hair growth was one of the drugs side effects. As a result, Rogaine (minoxidil) clinical studies were submitted to the FDA for approval. The clinical studies results were impressive enough for the FDA to approve Rogaine (minoxidil) as a treatment solution for androgenic alopecia (genetic hair loss). Additionally, Rogaine (minoxidil) is the only FDA approved hair loss solution that also works with female patterned hair loss. Unfortunately, minoxidil has been linked with hair shedding. To date, this phenomenon hasn’t been explained by physicians or other hair loss professionals. However, many believe that minoxidil causes the miniaturized thin hairs to shed, so the hair follicles grow thicker and stronger afterwards. Sadly, there are no clinical studies or scientific data to specify the direct cause for hair shedding. That said, many often confuse telogen effluvium (shock loss) for minoxidil shedding. Telogen Effluvium or shock loss is a form of short-term hair loss that generally occurs after stress, trauma or a surgical procedure. This temporary hair loss is predominantly contained on the top of the scalp. Shock loss is described as a chronic hair shedding for an extended period of time lasting up to 6 months. Hair restoration surgery can cause shock loss. Shock loss occurs when hairs are implanted in close proximity to surrounding (non-transplanted) native hairs. This trauma causes the surrounding non-transplanted follicles to enter the telogen (resting) phase and shed. The good news is shock loss is a temporary condition that usually resolves on its own. However, certain medical conditions including autoimmune diseases, thyroid conditions and underlying medical conditions can cause shock loss. Therefore, it is important to speak to a medical professional to rule out any underlying health conditions prior to having a hair transplant procedure. The most important aspect to consider is the surgeon selection. Choosing a qualified, skilled and talented surgeon is crucial for receiving undetectable, natural results that will last a lifetime. The skill, talent and experience of hair transplant surgeons varies widely, as do their results. Selecting a doctor with a track record of consistent patient results, is far more important than deciding whether or not to use minoxidil. What Happens If I Have A Hair Transplant Without Taking Propecia	Can Shampooing My Hair After A Hair Transplant Effect The Growth?